The 24 metre sailing yacht Skip’n Bou, listed for sale by Bertrand Vogele at Seaminds, has had a €350,000 price reduction. Seven guests can be accommodated in three cabins consisting of two twin VIP suites and a forward area given over entirely to the owner’s suite, all with entertainment centres and en-suite shower facilities. In addition, there are quarters for three crew on this yacht for sale. On the technical side, she has a Hall Spars high modulus carbon mast and a Park Avenue carbon boom, with a mast height of 33.16 metres above the deck and hydraulic Reckmann furlers. On deck she has Lewmar winches and carries a sail wardrobe of North Sails carbon/spectra sails. All told, she has a total sail area of 312 square metres while, under power, a single 230hp Yamar diesel engine gives her a cruising speed of 9 knots. 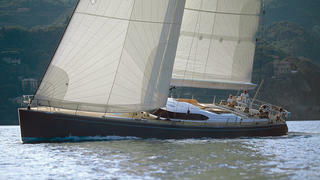 Lying in St Tropez, France, Skip’n Bou is now asking €1,750,000 with VAT paid.